Fujifilm has developed an exceptionally robust lens lineup over the last several years, but the one area that had been lacking was in a true 1:1 macro lens. 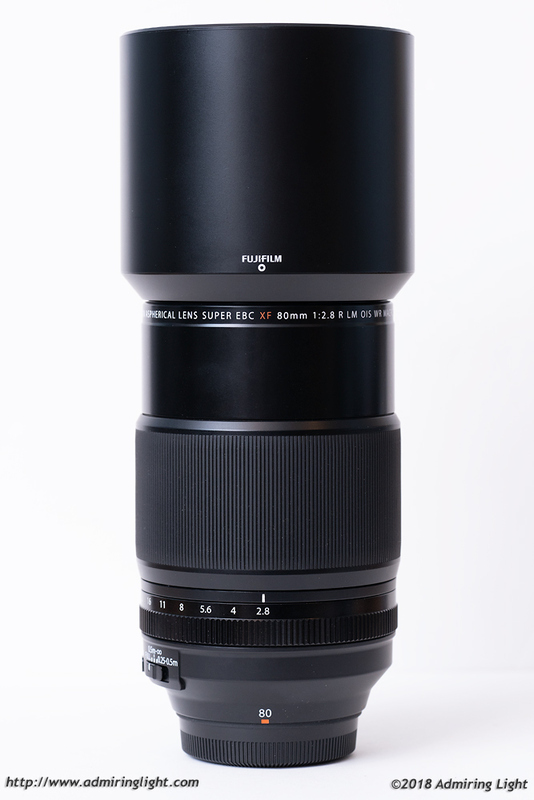 Fuji remedies this with their 80mm f/2.8 R LM OIS WR Macro, a lens with a slightly longer field of view than many macros, 1:1 magnification, an optical stabilizer and weather sealing. 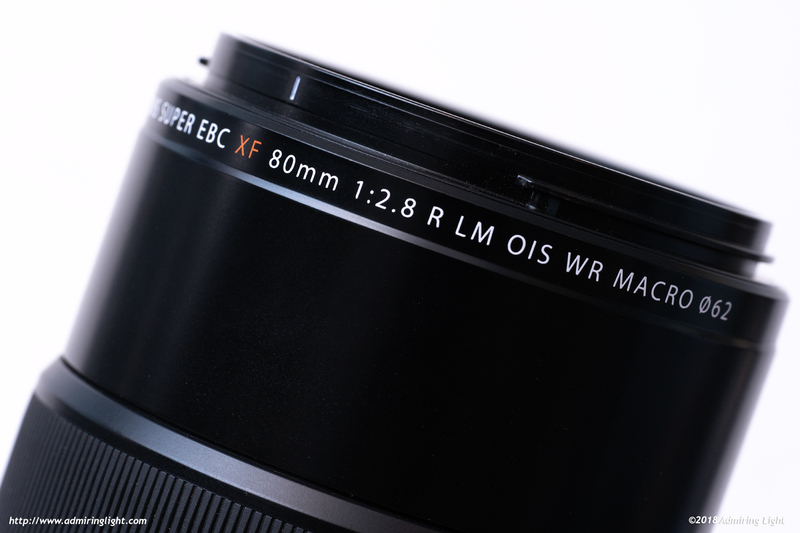 In this Fuji 80mm f/2.8 Macro review, I’ll go in-depth on this versatile prime lens. The Fuji 80mm Macro is the first 1:1 macro from the company, and to get that magnification, along with all the other bells and whistles, the lens isn’t able to achieve the compact size of its earlier, shorter brother, the 60mm f/2.4 Macro. The 80mm is sized typically for macro lenses in this focal length, but is a bit larger than most of the other Fuji prime lenses. The lens is constructed predominantly of a high grade plastic exterior, though I’d imagine the interior construction uses metals extensively. The lens is very tightly assembled, and has no flex anywhere on the body. The 80mm is an internally focusing lens, and as such, it stays constant length throughout the focusing range. The exterior feel is very similar to that of the Fuji 55-200mm lens, with the broad rubber focus ring and plastic construction. The use of plastics does help keep the weight below what it would have been otherwise, but the lens is still fairly hefty at 750g. The OIS element inside the lens is loose when the camera is powered off, so an audible thunk is heard when moving the lens around, by design. The lens handles pretty well on Fuji cameras with a grip, so X-T1/2 and X-H1 owners will have no issues at all. Those with the X-T20 or X-E cameras will want to use one of the accessory grips for longer use, as it’s a bit unwieldy without the grip. On my X-T20, I used the metal hand grip exclusively. The very broad focus ring is clad in ribbed rubber and has good damping, though the focus by wire makes manual focus a bit less tactile than I normally like for macro lenses. The metal aperture ring is very well damped, perhaps even a bit too damped, and I think the detents on this lens are a bit weaker than on some of Fuji’s other recent lenses, so it isn’t as satisfying to use as the f/2 primes. 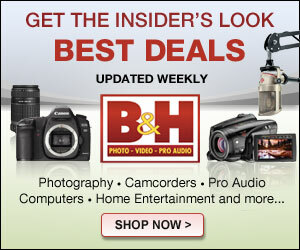 The Fuji 80mm macro features a linear motor system for fast autofocus. 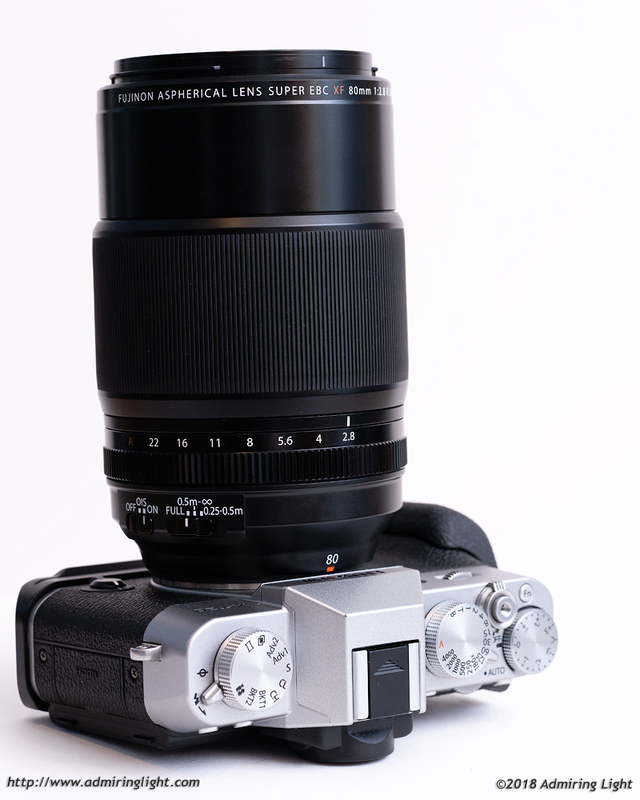 There is also a focus limiter switch, which restricts the lens to focusing in the macro range, outside the macro range, or in the full focus range of the lens. The autofocus in the Fuji 80mm is pretty quick. For non-macro shooting, it provides very speedy performance, locking quickly on the subject with excellent accuracy. In the macro range in good light, the lens also retains pretty quick and quite accurate autofocus. However, in dimmer light, things slow down considerably. At moderate distances, the AF speed is still decent in dim light, but once you start focusing closer up, the lens slows down a lot, and can take quite a while to focus on your subject. However, accuracy was still quite good. In all, it’s a better autofocus performance than a lot of macro lenses, but falls short of the best focusing Fuji primes. The image stabilizer in the 80mm f/2.8 Macro is rather good, as you’d expect from a Fuji lens. For everyday shooting, it’s good for 4-5 stops of stabilization, allowing for handholding in dark conditions without having to raise the ISO. At macro distances, it’s less effective, but still provides much needed stability at these high magnifications. I found that at 1:1, I could get fairly consistently sharp shots at around 1/40s, which is around 2-3 stops better than unstabilized, with some shots sharp as low as 1/20s. I typically require around double the typical handholding rule when shooting at macro distances, so this is a fairly good performance. Pingback: ?????? XF80mmF2.8 R LM OIS WR Macro??????????? | ????????????? Pingback: ?????? XF80mmF2.8 R LM OIS WR????????????????????????? | ????????????? Pingback: ?????? ?XF80mmF2.8 R LM OIS WR Macro? ? ????????????????? | ?????????? Nice comprehensive review sir! 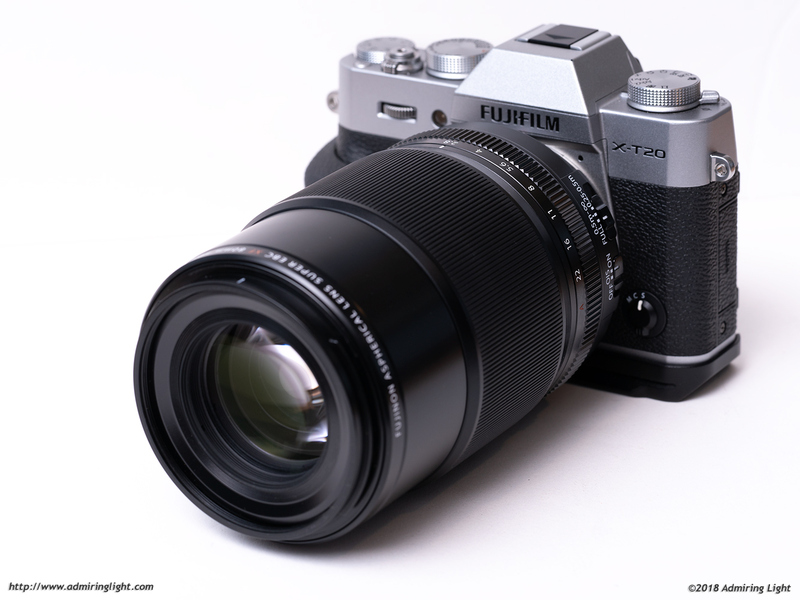 As a landscape and product Fujifilm X-System photographer, I use this XF80mm f/2.8 Macro, and honestly, I find it to be the absolute SHARPEST lens I’ve used in 40 years of photography! Though you do say it is “very sharp”, perhaps you should have made the point more emphatically, since a macro lens, after all, is all about sharpness and image detail at 1:1, and, IMHO, not so much about bokeh rendering in a protrait background. (For that, I’d get something like a 56 or 90mm anyway.) This is the first lens I’ve used with which image sharpening in Post is actually optional! And if I use focus stacking, I obtain results that rival FF and even medium format in sharpness and detail rendition! Thank again! Jordan, I know I’m asking this long after this review was posted, but hoping you can reply. I’ve looked at your other macro lens reviews, and am wondering your thoughts on this Fuji 80mm vs Olympus 60mm vs Sony 90mm. They all sound quite good, but I’m a bit bewildered by the large size and weight of the Fuji lens compared to the others. The Olympus is quite small and light (and much less expensive as well), and the Sony is similar in size/weight but covers a much bigger image circle. Seems like the Fuji is oddly large for its spec. For someone choosing a new mirrorless camera system today, who considers a good long macro lens a must-have, which do you think offers the best overall macro ability? I think they are all excellent, and I don’t think I’d choose a system based on small differences in one lens. That said, if I had to pick, I’d probably say the Sony 90 is the best of the three, but they’re all very good. The m4/3 system is the easiest to handle for macro shooting, though.